Dozer is back! He arrived mid-November, and will spend part of each day on exhibit. 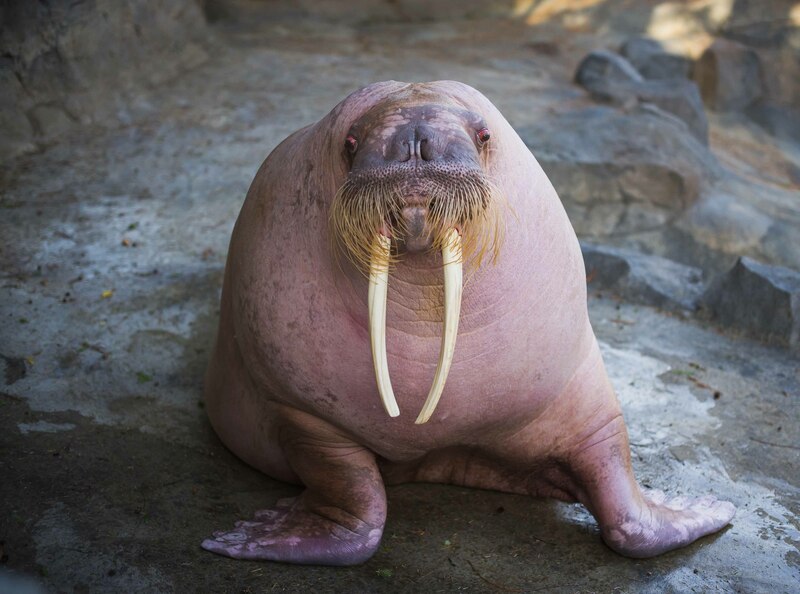 The hunky 3,450-pound walrus with the 17-inch tusks has come back to Point Defiance Zoo & Aquarium – but it’s not just visitors who’ll be charmed by the enormous whistling guy. Dozer’s back in town to woo the Zoo’s three female walruses Joan, Basilla and Kulusiq on a breeding visit that Zoo staff hope will result in one, two or all three of the females getting pregnant. This understanding in turn helps humans better conserve walruses in the wild. Pacific walruses are considered a “vulnerable” species, on the cusp of being endangered as climate change shrinks the sea ice they need for resting, giving birth and nursing calves. Dozer, who arrived from SeaWorld San Diego on Nov. 16, wowed both Zoo visitors and female walruses on his previous breeding visit earlier this year. His whistling – a mating behavior males use to attract females – could be heard clear across the zoo, and general curator Dr. Karen Goodrowe Beck confirmed that he’d definitely mated with Joan, Basilla and Kulusiq (on loan from New York Aquarium, and pronounced koo-LOO-sic). Sadly, hormone tests revealed that none became pregnant. It will be a while before Zoo staff will know for sure about Dozer’s success this time. Once a walrus egg is fertilized, it’s not implanted in the uterus for four to five months. Gestation takes even longer – about 15 months. In the meantime, fans can get up close and personal with Dozer and his ladies whenever he’s on exhibit – and be inspired to help walruses in the wild with walrus-friendly choices like not idling your car and turning your thermostat down a couple of degrees.